There's an electric crackle to the air this time of year, and an expectant feeling that carries you through the holiday season. Feasting and revelry are in store, there are gifts to give and plans to make - and there will be surprises along the way; catching the first flakes of the very first snowfall, turning the corner and stumbling on a house lit by a thousand fairy lights, pulling your sworn enemy's name for Secret Santa. 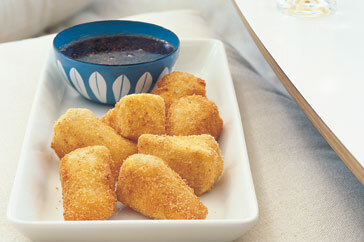 Fried camembert with blueberry sauce. ﻿At this time of year when you are rushing in eight different directions and battling crowds, or sitting at home watching your car get buried in a snowdrift that will surely turn into a solid block of ice, the important thing to do is create a sanctuary for yourself. Surround yourself with comfort and lights, food and warmth, so that you are as excited to be at home as you are to be out celebrating. And once you create your ideal holiday place, invite your friends to share it with you. Use your guests as an excuse to get your Christmas tree up on time. Cook a scrumptous feast to say "I am so lucky to have you in my life" and "We are in this holiday weight-gain thing together, amiright?" Click here for a playlist of Christmas music, and click here for your minute-by-minute cooking plan. You will be able to cook and plate this gorgeous meal by yourself if you give yourself enough time beforehand. If it seems overwhelming, consider splitting these tasks with a friend or loved one - what looked impossible will suddenly seem easy. But for now just sit back and join me in food-fantasyland. Designing the perfect menu is tricky. You want food to appear piping hot, but you want to spend as little time in the kitchen as possible while your guests are sitting at the table. This plan will allow you to do 90% of the cooking ahead of time, then just pop things in the oven or gently warm them on the stove at go time. You also want to help your guests pace themselves so they savor every bite, from fried cheese course (oh yeah, you heard me right) to the last drop of their hot chocolate. I like to print out little menues so people know what's in store, and I also like to plate the dishes myself - for portion control as much as for presentation. Incidentally, the following menu was tailored to accomodate one friend who's trying to go easy on the lactose, and another friend who can't eat gluten. The one problematic dish is the fried camembert - which will be breaded in gluten-free crumbs, and is easily opted out, if my other friend would like to double up on prosciutto-wrapped melon. Otherwise, coconut milk, rice, and hot chocolate made out of beer are such excellent substitutions that you won't even miss the foods I'm leaving out. These few decadent bites will get your meal started right. The sauce can be made and stored in a pot on the stove for easy rewarming. The camembert can be breaded and stored in the fridge until your guests arrive. 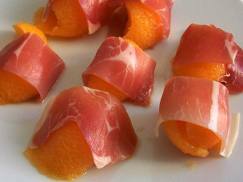 The melon can be pre-wrapped in prosciutto and stored in the fridge - put a damp paper towel in between the food and the lid to keep the meat from drying out. When your first guests arrive, start warming the sauce and heating oil in a fondue pot. Pour some glasses of Bordeaux to keep them company, and fry the cheese while you quickly plate the melon. This vegetable course is sweet and sustaining - delicious comfort food. 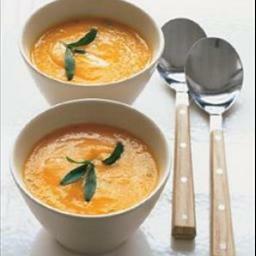 You can make the soup hours before your guests arrive - just begin gently heating it when they first start to show up. The gratin dish takes 55 minutes to cook, covered, which can be done ahead of time. Preheat the oven in anticipation of your guests, and then bake it uncovered for 20 more minutes so the top will begin to brown. You know what else takes about 20 minutes? Eating the appetizer course. Yeah, you've got this. This delicious curry takes under 10 minutes to cook! Your prep will take some time, but that can all be laid out ready-to-go in advance. Start your rice cooker when the guests arrive, then relax and enjoy the meal. During the 10-minute cooking interlude, you can ask a helpful friend to clear dishes and pour some Chablis. The main course will be ready in no time. 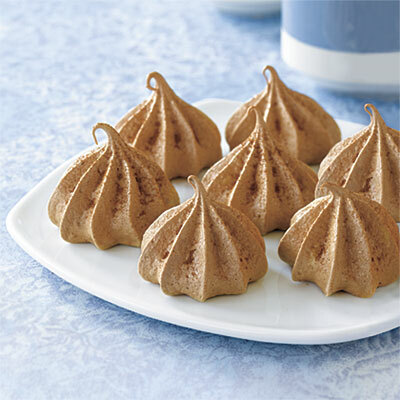 These elegant little cookies come to us from The Best of America's Test Kitchen, so they're practically fool-proof. Also, they can be made in advance and stored in an airtight container. The hot chocolate will take a little bit of your attention, but your guests will appreciate the effort - and the chance to take a little time to digest. You may be tempted to pre-rim your martini glasses - RESIST THE URGE. Over time the lemon juice will cement the sugar to your glass. OMG...YUM! I CAN.NOT.WAIT. until Saturday. SOOOOO GOOD!